After revealing Salman Khan's look as a bearded, old man on 15 April, the makers of Bharat have now released a new poster, featuring the actor as a young circus artiste. The poster declares that the photograph is from 1964 and superimposed on it are images of different stunts. Khan took to his official social media accounts to share the still. An official remake of the Korean film An Ode to My Father, Bharat will span over five decades, with Khan sporting five different looks. Bharat is directed by Ali Abbas Zafar (who also helmed Gunday, Sultan, Tiger Zinda Hai). This film marks his third collaboration with Khan. Katrina Kaif stars as the female lead, though no details have been revealed regarding her character. Disha Patani, Tabu, Nora Fatehi, Jackie Shroff and Sunil Grover will be seen in supporting roles. 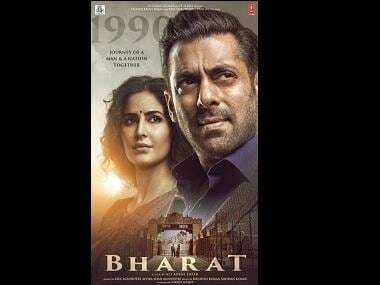 Produced by Atul Agnihotri's Reel Life Production Pvt Ltd and Bhushan Kumar's T-Series, Bharat is slated to release this Eid on 5 June.